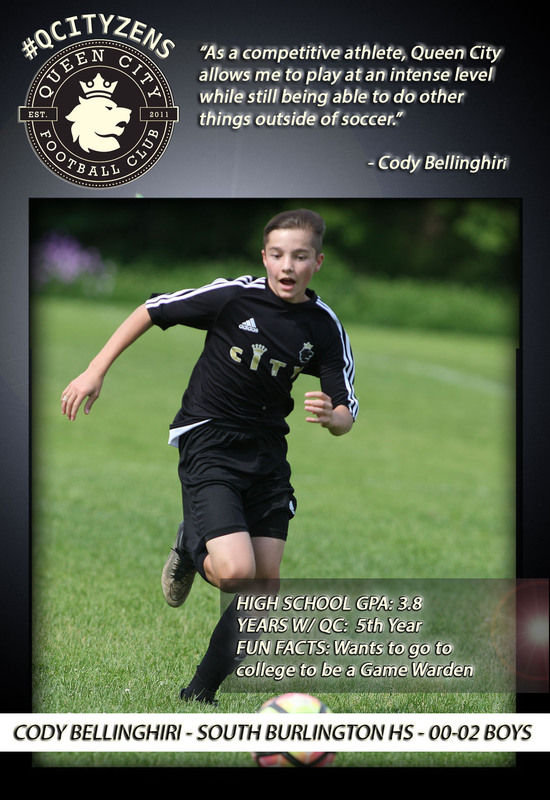 MARCH 25, 2019 - Our second QCITYZEN is another longtime member of the club, Cody Bellinghiri. Cody has been a great leader with Queen City FC starting as a U14 player. He is entering his 5th season with club participating this year on the 00-02 Boys team. Cody was one of the original boys players to come to Queen City FC from the Lake Champlain Islands as there has been a longtime link between the islands and the club. “As a competitive athlete, Queen City allows me to play at an intense level while still being able to do other things outside of soccer," said Cody. Off the field, Cody is an excellent student in the classroom with a 3.8 GPA at South Burlington High School as a junior. He equally is known amongst the club coaches and players as a kind hearted and positive member of our community. His coach, Kyle Underwood descibes him as a great role model for young players in the club by how he conducts himself. "Cody has always been an example of how we want our players to conduct themselves. Not only is he a great player, but the intangible leadership qualities he possesses are what we want for all of our players. He always shows tremendous sportsmanship, and is always welcoming new players into the club. He is an incredibly unselfish human being and a great role model for our youngest club members." An avid outdoorsman, after graduation, Cody hopes to go to college and study to be a Game Warden. Congratulations Cody! You are a great #QCITYZEN!